You'll be £25.00 closer to your next £10.00 credit when you purchase Marcus Agrippa. What's this? Marcus Agrippa personified the term 'right-hand man'. As Emperor Augustus' deputy, he waged wars, pacified provinces, beautified Rome, and played a crucial role in laying the foundations of the Pax Romana for the next two hundred years – but he served always in the knowledge he would never rule in his own name. Why he did so, and never grasped power exclusively for himself, has perplexed historians for centuries. In his teens he formed a life-long friendship with Julius Caesar's great nephew, Caius Octavius, which would change world history. Following Caesar's assassination on the Ides of March 44 BC, Agrippa was instrumental in asserting his friend's rights as the dictator's heir. He established a reputation as a bold admiral, defeating Sextus Pompeius at Mylae and Naulochus (36 BC), culminating in the epoch-making Battle of Actium (31 BC), which eliminated Marcus Antonius and Queen Cleopatra as rivals. He proved his genius for military command on land by ending bloody rebellions in the Cimmerian Bosporus, Gaul, Hispania and Illyricum. In Gaul Agrippa established the vital road network that helped turn Julius Caesar's conquests into viable provinces. As a diplomat, he befriended Herod the Great of Judaea and stabilised the East. As minister of works he overhauled Rome's drains and aqueducts, transformed public bathing in the city, created public parks with great artworks and built the original Pantheon. Agrippa became co-ruler of the Roman Empire with Augustus and married his daughter Julia. His three sons were adopted by his friend as potential heirs to the throne. Agrippa's unexpected death in 12 BC left Augustus bereft, but his bloodline lived on in the imperial family, through Agrippina the Elder to his grandson Caligula and great grandson Nero. 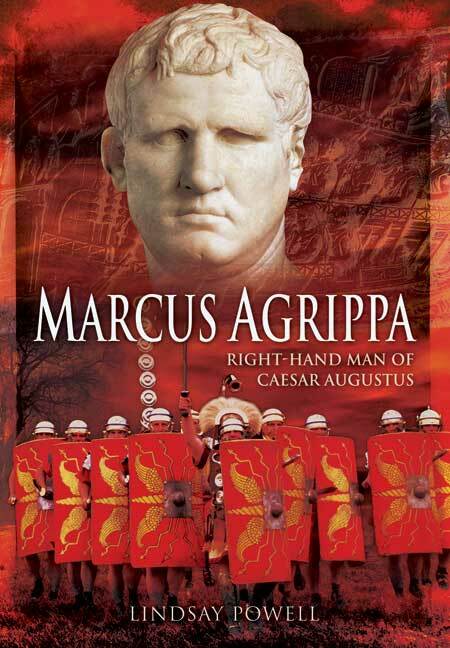 MARCUS AGRIPPA is lucidly written by the author of the acclaimed biographies Eager for Glory and Germanicus. Illustrated with colour plates, figures and high quality maps, Lindsay Powell presents a penetrating new assessment of the life and achievements of the multifaceted man who put service to friend and country before himself. Powell portrays Agrippa in a vivid way, bringing this key figure of the Principate out of the shadow. His book is a fine and original introduction to these troubled years of historical translation, leading the reader through the end of the Republic, the Civil Wars and the birth of the Roman Empire. Whew, is about all I can say. I am always in awe with the why and the how that authors write these kinds of in depth, really in depth, books. This is absolutely the quintessential book on Caesar Augustus's right hand man - Marcus Agrippa. As I continued to read this, I could not help thinking about how it correlates to today's America and the whole political happenings, currently. Very very interesting. Overall then, the book succeeds in its basic purpose of bringing Agrippa out of the shadow of Augustus and portraying him as a historically important person in his own right. The author's easy writing style and ability to compress complex issues into concise explanations make this book a valuable addition to the library of anyone interested in the formative years of the Roman empire. A terrific book especially for historians and academics who will find a wealth of information in it. A really good effort...... Surely the documentation, footnotes, bibliography, will be well received by academics. Its going to be a very valuable reference book on Agrippa. Frankly, probably better than I could have done. Now I have read your book, I know so much more about this terrific chap......... I do find it sad and extraordinary that he has never caught the eye of the Royal Navy's Ship's Naming Committee in the past. We have had Caesar, Cleopatra, loads of Greek heros in the Leander class but no ship bearing the name of a man who exemplified so many of the qualities that the Royal Navy prides itself in instilling in its people: tragic! Thank you for doing such a comprehensive job of bringing the man to the public's attention in your scholarly but highly readable biography. And I know one or two holds myself mate! The film was, of course, Carry on Cleo. But who was the real Agrippa? Growing up to be a historian of sorts I became aware that he was one of the men behind Julius Caesar but knew little else. After visiting Rome I began reading about its history and the characters behind it. Agrippa, though only a young man when Julius Caesar was murdered, rose to become the power behind the rise of his friend since childhood, the future Augustus Caesar. This book focuses largely upon that friendship. As with all biographies of ancient people some incredible detective work has to be undertaken to reconstruct elements of their lives and the author seems to have left no stone unturned. The book recounts Agrippa’s rise from relatively humble beginnings to becoming, not only the friend of Augustus but also his son in law and Lieutenant. He was responsible for Augustus’s victory at the naval battle of Actium, bringing about the defeat of Marc Anthony and Cleopatra. Through his numerous children, Agrippa would become ancestor to many subsequent members of the Julio-Claudian dynasty, whose position he helped to attain, as well as many other reputed Romans. He died aged 51 in 12BC. The book has an exhausting and all encompassing set of notes on sources/bibliography etc. which makes this volume of especial use to other historians interested in Roman history. It is also a fascinating and absorbing read for the enquiring amateur. Finally, a one volume all encompassing book, which details Agrippa’s life and recounts all his achievements and associates, I only wish it had been written before my trip to Italy! As the advertising blurb states, this is the first modern biography of Agrippa in English and a quick check on the Amazon website proves emphatically that this is the case. According to the author biography on the inside back cover he has also turned his attention to two other notable Roman figures, Drusus and Germanicus, which I will be ordering in due course. Let us hope that this author turns keeps his attention focused on other neglected ancient historical figures and weaves his magic to unravel their lives, thereby enriching those of his readers. This is a five star read.